We need big, big changes in the United States. Many of them will require the Federal Government to spend unprecedented amounts, including deficit spending to enable us to solve problems that have languished, creating needs, for many, many years. How can we get these changes legislated through a political system that has been increasingly less responsive to most people over the past four decades. There’s only one way that will work without revolution. Just as every Spring we can count on the Peter G. Peterson Foundation (PGPF) to do a supportive press release when the CBO issues one of its budget outlook 10 year projection reports, we can also count on being treated to public statements by Maya MacGuineas joining in the Peterson Army choir, warning about the coming debt crisis, and singing about the glories of deficit and debt reduction. And this while completely ignoring the real and sad consequences of deficit and debt reduction policies throughout the world since the crash of 2008, as well as previous applications to Latin American, Asian, and the nations of the disintegrated soviet empire, most notably Russia itself. Let’s look at Maya MacGuineas latest effort; her testimony to the Senate Budget Committee. The Peter G. Peterson Foundation (PGPF) always does a press release when the CBO issues one of its budget outlook 10 year projection reports. The PGPF did another in January quoting its President and COO, Michael A. Peterson. Let’s go through that press release and see how many troublesome or false statements we can find. Here’s a breakdown of the press release quotation from Michael Peterson. Today’s CBO report reminds us once again that our nation has significant fiscal challenges that have yet to be solved. It certainly does, but I doubt that Peterson and I would agree on what those challenges are. He thinks they have to do with bringing the national debt under control. I think they have to do with creating full employment with a federal job guarantee program, price stability, a robust economy, a great public and free educational system through graduate school, stopping and reversing climate change, providing everybody in, nobody out, no co-pays and no deductibles health care for all, a first class infrastructure, and a greatly expanded social safety net including a doubling of SS benefits. The Peter G. Peterson Foundation (PGPF) and its allied army of associated deficit hawks want the Congressional Budget Office (CBO), the General Accountability Office (GAO), and the Office of Management and Budget (OMB) to do fiscal gap accounting and generational accounting on an annual basis and, upon request by Congress, to use these accounting methods to evaluate major proposed changes in fiscal legislation. Generational Accounting is an invalid long-range projection method that doesn’t take into account inflation, the projected value of the Government’s capability to issue fiat currency and reserves in the amounts needed to fulfill Congressional appropriations, and re-pay its debts, the projected non-Government assets corresponding to government liabilities, the likely economic impacts of Government spending, surpluses, and deficits, the impact of accumulating errors on projections, and the biases inherent in pessimistic AND contradictory assumptions. It is a green eye shade method that ignores both economic and political reality. Paul Krugman Still Believes That “the debt” Can Be a Problem for the U.S.
Far from celebrating the deficit’s decline, the usual suspects — fiscal-scold think tanks, inside-the-Beltway pundits — seem annoyed by the news. It’s a “false victory,” they declare. “Trillion dollar deficits are coming back,” they warn. And they’re furious with President Obama for saying that it’s time to get past “mindless austerity” and “manufactured crises.” He’s declaring mission accomplished, they say, when he should be making another push for entitlement reform. All of which demonstrates a truth that has been apparent for a while, if you have been paying close attention: Deficit scolds actually love big budget deficits, and hate it when those deficits get smaller. Why? Because fears of a fiscal crisis — fears that they feed assiduously — are their best hope of getting what they really want: big cuts in social programs. For some time now, MMT has been receiving criticism from self-identified progressives charging that MMT economists and advocates aren’t concerned about one of the most pressing problems in modern democracies and especially in the US, namely, increasing and often extreme inequality. MMT supporters have responded by citing much previous work on inequality, a lot of it done at the Levy Institute, by pointing out their great concern over the problem, and their work in advocating for a Federal Job Guarantee that would do more than perhaps any other single piece of legislation to ameliorate both poverty and inequality. Recently, that tweet along with an image has been making the rounds on Facebook as an Alternet photo. The sound bite in the tweet looks great, after the manner of a logical truism. This, the fifth post in a series evaluating the fiscal responsibility/irresponsibility of the Governments of the United States (mostly the Congress, the Executive Branch, and the Federal Reserve) by Administration periods, beginning in 1977 to 1981 with the Jimmy Carter period, will cover the performance of the Government on the environment and climate change aspect of “public purpose.” Posts 1, 2, 3, and 4, discussed some basic definitions and assumptions of the series and evaluated Government performance relating to economic stagnation, living wage full employment, price stability/inflation, implementing universal health care, and educational reform. 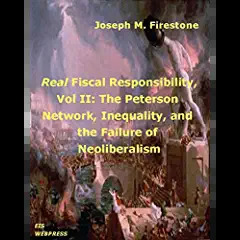 I’ve explained why fiscal responsibility is closely connected to the idea of public purpose, in this post prior to beginning the series. You’ll want to read it, if you want to know what I mean by “public purpose,” and see what else that pregnant term includes, apart from enhancing the environment.